Avoid temptation to indulge in fatty foods by getting to bed early. Notice a surge in your food cravings? You may want to check your bedtime. In the first laboratory study of its kind, researchers from the University of Pennsylvania showed that otherwise healthy people who stay up late and don’t get a good night’s sleep are likely to gain weight from indulging in fattier foods during the late-night hours. In the study, published in the journal Sleep, 225 non-obese people between the ages of 22 and 50 were randomized into a sleep restriction group or control group for 5 nights—the sleep restricted group slept from 4 a.m. to 8 a.m. while the control group slept from 10 p.m. to 8 a.m.
Because the study was conducted in the lab, the researchers were able to closely follow the eating and sleeping habits of all the participants. The subjects all ate the same meals at the same time each day, and they all had unlimited access to a fully-stocked kitchen. The subjects who only slept four hours a night ate more than 550 additional calories than the control group and gained more weight. Overall, men gained more weight than women and African-Americans put on more weight faster than did Caucasians. 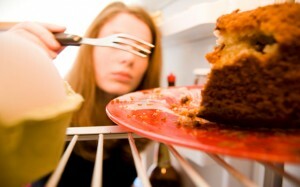 Apart from just being up late and possible boredom causing the tendency to drift over to the fridge for unnecessary snacking, some research has found that inadequate sleep can increase levels of the hormone ghrelin, which stimulates hunger cravings, while decreasing levels of leptin, the hormone responsible for feelings of fullness. Internal mechanisms aside, a good night’s sleep should always be a part of any weight loss or weight maintenance strategy. Not to mention a healthy lifestyle. Turn off the TV and other electronic devices. The light from such tools many people use to relax to during the later hours are actually messing with natural melatonin production, and the ability to fall asleep. Try reading a book or listening to music or an audio book to help your body relax and get into sleep mode. Reduce caffeine intake earlier in the day. Depending on the person, caffeine’s effects can linger for up to eight hours and affect the ability to fall asleep. If you know you’re sensitive to caffeine, aim to be caffeine-free by about 2 p.m. Exercise earlier, not later. A known benefit for a good night’s sleep, exercise can also make it difficult for the body to wind down after. Try exercising in the morning or an earlier time if you’re a regular evening exerciser. Enjoy a hot bath. Having a hot bath about an hour before bedtime can help the body and muscles relax. It can also increase core temperature, which upon leaving the bath the core temperature will drop and cause a natural release of melatonin, the hormone that tells the body to go to sleep. Supplement with Sleep Support & Renewal. If falling asleep at a set, desired time seems impossible for you, or you feel the sleep you are getting isn’t the quality sleep that you need, try supplementing with melatonin. Our Sleep Support & Renewal contains safe and effective amounts of melatonin and is a fast-acting, spearmint-flavored spray with additional ingredients such as theanine and chamomile that have shown to promote a calm and relaxed state. The ingredients work synergistically to reduce the time it takes to fall asleep while also helping to improve the quality of sleep and increase total sleep time. Contact me if you'd like more information.